Voices questions how text is connected with sound, presenting the ear and the eye with works that have many different outlines. This show brings together sound pieces, films, scores, and artist’s books… The figure of the poet and visual artist Bernard Heidsieck is present between the lines. In the late 1950s, by way of the practice of reading, and the use of technological tools, he removed the text from the space of the page. As a result, the poetic field was open to other forms and styles of expression. What is the current situation with these avenues that he has helped to open up? The works of contemporary poets will be presented, echo-like: Anne-James Chaton, Jean-Michel Espitallier, and Jérôme Game are all pursuing this line of thought, using new tools. 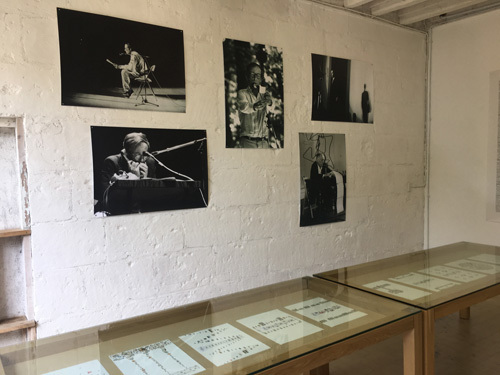 So as not to restrict this exhibition just to the sphere of poetry, it is interesting how, in tandem, it shows how certain visual artists and composers are appropriating the issue of the text, and coming up with sonic/acoustic translations. They include Sammy Engramer, Emmanuel Lagarrigue, Rainier Lericolais, Violaine Lochu, Pierre-Yves Macé, Sébastien Roux, Julie Vérin and Quentin Aurat. As an initiator of sonic poetry and action poetry, Bernard Heidsieck has also produced many works on paper, and it comes as no surprise that, in this Abécédaire no.6 “clef de sol” [Primer no.6, “key of G”], the inventor of score-poems—poèmes-partitions—is once again playing with the links between visual poetry and music. “Ringing out the poet’s colourful alphabet, letter after letter […]. Bernard Heidsieck has cut out each one of the letters from newspapers and magazines, in many different forms, then glued them on and around the lines of a score introduced by a key of G. Page after page, the book offers abstract configurations—in which it is quite permissible to make out a diverse range of routes, constellations, jets, spheres, constructions, rain, and other forms of volatility offered to the reader’s sensitive and interpretative freedom […]”. Gilles Froger in Archive de la Critique d’Art (2015). Recorded voice: Kaija Matiss. Text: Bob Dylan. Anamorphosis: a work whose forms are distorted in such a way that it only assumes its real configuration when it is looked at from a particular angle. For some years now I’ve been working on sonic translation, a principle which consists in using an existing work (novel, painting, piece of music…) as a score for a new sound piece. It is in this context that I’ve become interested in the transposition of the phenomenon of anamorphosis into sound. So I’ve imagined a series of instrumental pieces and sound installations which use space as a distorting tool and a means of resolution. 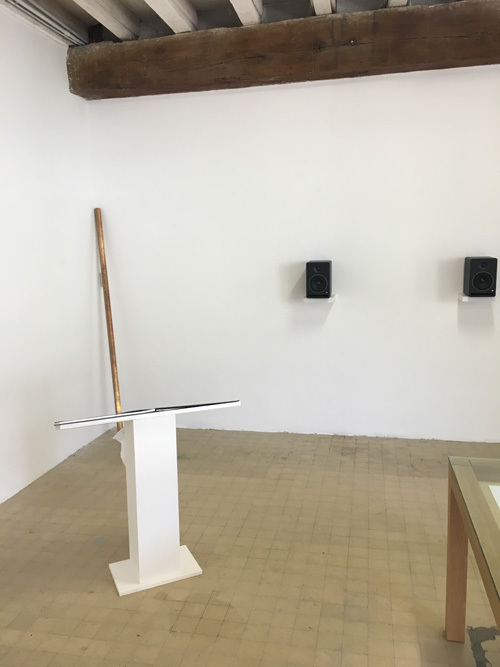 For each one of the anamorphoses, people listening are invited to explore the sonic field and determine the listening point from which the “real configuration” is heard. This whole little game is like a pretext for exploration, listening to the transformation of sounds and their combinations: “The quest for movement and trompe-l’oeil excludes the special, unambiguous, head-on vision, and urges the onlooker to move continually about in order to see the work in its ever-differing aspects, like an object in perpetual transformation.” (Umberto Eco, L’Oeuvre ouverte). With the piece presented here, it is no longer a matter of transposing the anamorphosis in a direct way by imagining the spectator moving about in the sound the way he moves about in front of the image. But rather of thinking of anamorphosis as a method of organizing sounds in time. During a lecture on Leibniz, Gilles Deleuze broaches at length the issue of viewpoint and perspective. He defines anamorphosis as a specific case of perspective and differentiates between metamorphosis and anamorphosis. Metamorphosis as a movement from one form to another form. Anamorphosis as creating a form from the formless. This is what interests us here. No longer the search for the listening point, but how sounds take form and then revert to disorder. Sounds make sense, because sounds are words, a recorded voice uttering Bob Dylan’s words: "We can’t change the present or the future, we can only change the past, and we do it all the time." Production : Anima Ludens / Solang Production / Language Art Studio : “How are we to bear witness to our experience of the image today, its ubiquity in all media, its intimate economy, public and political alike, its variety, and its wealth despite standardized practices? This is the question that lies at the root of this work. The idea was to answer it by questioning the textimage, which is to say the link, and the gap, the interstice between the legible and the visible. And a photographic show using writing seemed to be the ideal place for making such an attempt: hanging photopoems on the walls, these being centered blocks of text written in prose on 280 g/m2 satin paper, with a square 60 x 60 cm format, printed by plotter and then affixed to the walls—and seeing what this does to the ways we look at things. Showing through words, lending momentum to them and to the ocular narratives they underpin by way of the arrangement of the photographic exhibition: this is the wager of these photopoems. Produced by a special camera—writing, conditioned by the visual—, these photos in a new genre, at once documentary and visual, have as their starting point the fact of questioning the ways in which we see the world today, despite, through, or even because of the endless and denser proliferation of images of every kind. Will continually tipping from a reading system towards a vision system get us to perceive things and the world anew, in the manner of an enlargement or an off-centering. And will we be able to play with the codes of the photographic exhibition (printing, setting to scale, hanging) like so many ways of re-mobilizing the codes of narrative, description, and plot? That remains to be seen…” Jérôme Game. To date, the “Portraits” collection numbers 65 works. Each piece is silkscreen- printed on a 120 x 176 cm format. 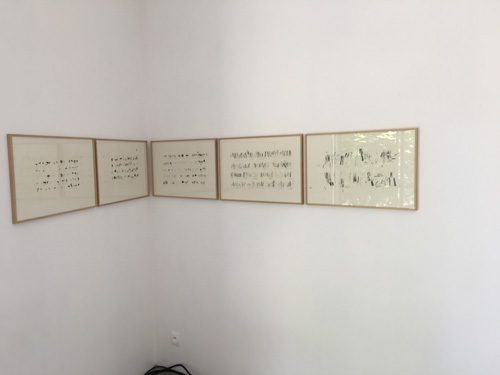 By supposing that we are defined by the writings that we carry with us, Anne-James Chaton produces her portraits by taking from the model all the textual documents that the subject has with him/her during the meeting with the artist. 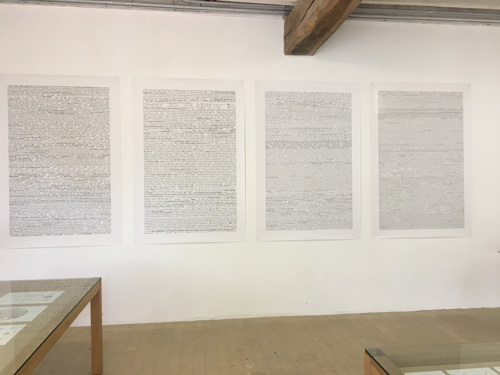 Anne-James Chaton’s “Portraits” are based on the transcript of the contents of these documents of everyday life, such as bank statements, metro tickets, restaurant and shopping bills, bank cards, subscription cards, loyalty cards, etc. 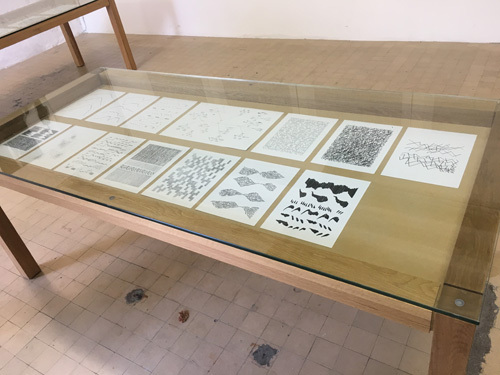 The information is gathered in the order in which the model gives it to the artist, and re-created by complying with its typographic marks, in such a way as to construct a lengthy sequence of data. This written litany, where meaning and identities are endlessly dissolved and remade, takes form in accordance with the kind of gaze cast. ELIZABETH CLARK: BETWEEN WORDS (2010-2013). Score, print on paper and annotations by the artist and the musician. Courtesy of the artist and the Galerie Dohyang Lee, Paris. Between the words of a text, there is punctuation. This discreet and at times forgotten element is nevertheless an essential part of the language it surrounds. Elisabeth S. Clark’s Between Words explores this space and the interstitial notion of in-between. Using the long poem “Nouvelles Impressions d’Afrique”, Raymond Roussel’s work is edited, but without any words, in a way that singles out the exact facsimile of the author’s punctuation. Just the punctuation, which is turned into a score, becomes the main thread. This score for orchestra and voices has been performed several times by an orchestral ensemble and singers. From each one of these interpretations, the artist and the musicians re-appropriate the score, by adding personal annotations to it. The fact that Raymond Roussel was first and foremost a musician before becoming a poet is a little known fact. The artist has realized that the linguistic structure devised by the author for this complex poem can be compared to a musical structure. In underscoring and examining the topography of language, Elisabeth S. Clark’s Between Words draws our attention to a significant aspect of the construction of language, its material nature, its acoustic nature, and its choreography. By shifting between silence and sound, Raymond Roussel’s landscape of punctuation offers a musical writing that is as sonic as it is silent. JULIE VERIN AND QUENTIN AURAT: ÉTUDES DE DECHARNEMENT (2018). Graphics Notes. Éditions Laura Delamonade, edition of 500, 24 cm x 34 cm. “Using the recording of his voice as he reads a poem, Sammy Angramer extracts the graphic image from the sound waves and slips this image of the updated voice over the corpus of Mallarmé’s writing. 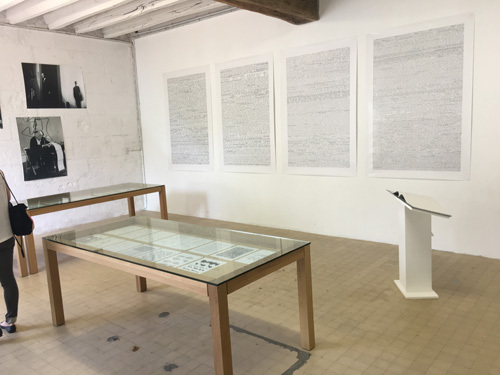 The 26 plates in the exhibition borrow the layout of the posthumous publication, in 1914, in the Nouvelle Revue Française, respecting the typographic diversity and the whole masterful interplay of spaces and blanks which lend Mallarmé’s text different reading levels. […] The object is silent, the listening is visual and it is in accordance with Nietzsche’s wish that we must “hear with our eyes” the voice that is lodged in the sensibility of the line, in the ink itself, in the secret murmuring of an italic wave, towards its mutedness. The image of the pronounced word encompasses the signifier of alphabetic writing, the text is scrambled by the trace of its utterance that has become unpronounceable. The emphasis is, quite literally, on the form of the utterance, because the nature of what is uttered will remain hidden behind what creates the imagery. It is activity itself that is the form, and its abode is “what is expressed”, but no sooner is it said than this becomes blurred, and only appears henceforth as the trace which metamorphoses the writing. This strange conversion consisting in producing images and volumes based on a non-phonological relation to the voice puts the spectator at the centre of a strangely silent orphism, where the gaze alone is verbalized.” Jérôme Duvigneau, 2010. Engraved copper on oak,180 x 4 x 4 cm. An attempt to record and/or represent a word. A sentence written by Hélène Bessette (Celui-ci ne m’a pas tuée) is repeated like a mantra. The artist pours sand on to a strip of copper, to the beat of his voice pronouncing these words. Acid is then sprayed on to it, and the whole thing is cleaned. The trace that remains is the “mark” of these words, and its persistence. SEBASTIEN Roux: Nouvelle (2012): This piece is part of the artist’s work Traductions/Translations, where he uses the sound sentences of Gustave Flaubert’s La Légende de Saint Julien l’Hospitalier. The acoustic material present in the piece is deduced from the sentences of the text which describe sound situations, and contain dialogues. In the wake of Song recycle, Chorale is a piece based on the principle of musical recycling. The basic material is a selection of well-known songs, hits sung by amateurs posting their videos on YouTube. Here there are five different people singing the same song. Each one of the voices is assigned a loudspeaker in the broadcasting system. These ordinary, everyday voices are rendered unfamiliar by different processes of decomposition/recomposition (cut-up, reversal, micro-editing, time-stretching) which alter their melodic substance but without doing away with their vocal qualities. We recognize that someone is singing, but without identifying (or only very briefly) what was originally sung. Far from being erased, the acoustic artefacts peculiar to the original mp3 documents are accentuated, and incorporated in the musical writing. The original track of Daniella Marxer’s short film, 5 mins. Rainier Lericolais has been working since 2003 with the filmmaker Daniella Marxer. For this short film Voices (2018), the two artists worked using one and the same production process, involving collecting and assemblage. For Daniella Marxer, this involved constructing this short film using rushes from her latest film mon amour (2017), which were then put together to make a different film: the portrait of two women of different ages, the younger of whom raises an endless string of questions. For Rainier Lericolais, using the film-maker’s rushes, it was a matter of collecting not the images but the sounds of voices, to offer us a sound track where all that emerges from the not very intelligible dialogues is the musicality and sonority of the voice. Broadcast on five loudspeakers, 38 minutes. “HK Live!” is a radiophonic postcard of a stay in Hong Kong in the summer of 2010, which draws up a virtual portrait of the City-State by travelling into its acoustic matter, real and fantasized alike. A narrator moves between the world of Asian cinema and the prosaic world of Hong Kong today, captured by a portable mike. With noises, voices, dialogues and moods of both the city and its reflection on the screen running through him, he verbally strolls between these worlds the way a ball in a pinball machine bounces around in a glass box, propelled by the acoustic matter of the urban fabric and films he has seen. On the very surface of heterogeneous signs, he grows as an explorer of himself, replaying sequence shots and editing ideas in his voice and his own words. Or how the sound capture of a city and its different narratives makes a literary re-engagement possible. A contrapuntal weave of voices reading texts which are pirate emails(fake stories of money hidden in African banks). With the voices of Jean-Michel Espitallier, Sandy Ameruio, Jean-Marc Montera, Erik Billabert, etc. L’IBISCUS N’EST PAS UN ANIMAL (2012), 7’. Can we really trust language? 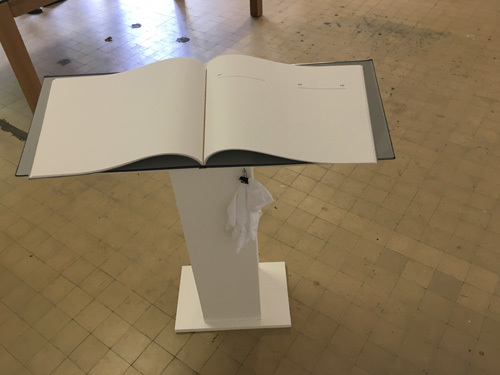 This is the question seemingly posed, in the manner of comic absurdity, by this sound piece, which spools a list of words which are defined by what they are not (namely, animals!). The fact is that this negative clue casts confusion over their real sense. Are they not essentially, it just so happens, animals, because we are told that they are not animals? The reading is gradually jammed by vocal loops which, by spooling the same list of names “which are not animals”, end up by turning the utterances into a verbal matter which lets us hear another (animal?) language. This work involves 60 very short texts (of equal length) which are so many micro-fake dialogues with 20th century writers, whose breathing has been taken from recordings of real interviews. I am interested in the way in which other poets and writers used to read and have read. So, in a very systematic way, I have put together a collection of voices on disks and tapes. Systematic insomuch as I bought everything I managed to find here, in France (which is to say, not a lot), during my trips abroad, visiting record dealers, and using American catalogues of companies specializing in this type of edition (Caedmon, in particular), including, incidentally, European authors. Two major features are in fact shared by all the authors successively summoned: on the one hand, as I have just mentioned, their voices have been recorded and, on the other hand, they are no longer alive. The breathing must only come from an edited disk or cassette, available in shops (this does not involve delving, for example, into Radio archives or plunging into a bottomless well). When some of the authors read, you cannot hear any breathing, so they are ruled out by force of circumstance. 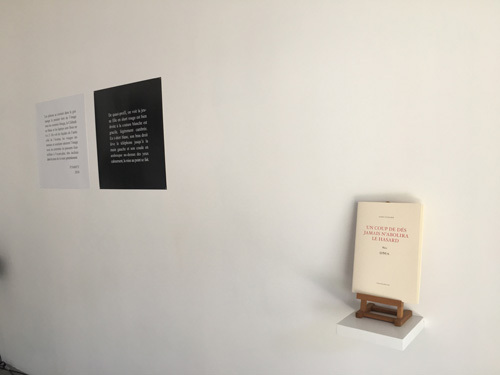 The reading arrangement is as follows: There is broadcasting via loudspeakers of the “real breathing” of each one of them, “perfectly audible”—looped—, “in counterpoint” to the live reading of the text which tries to conjure up the vanished author—with no overlay of any verbal statement. Sometimes a few brief acoustic objects are present. Extracts: Antonin Arthaud, Gertrude Stein, Ezra Pound. 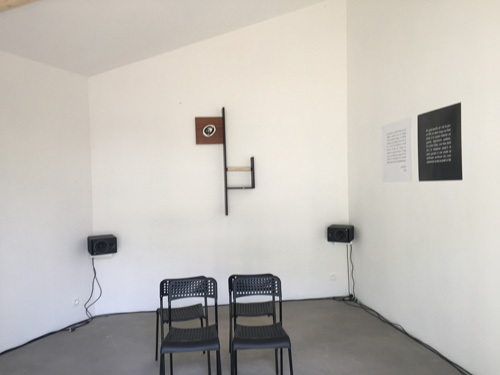 The project Tu apparais, Elias, puis/tu disparais consists in several acoustic installations organizing the meeting between two writers, Camille de Toledo (born in 1976) and Fernando Pessoa (1888-1935). That meeting, in the form of dialogue constructed from extracts from their writings, takes place like a philosophical stroll in different places. Following the idea of the patrol or round, it plays with sequences between several key notions of these two authors (the passage of time, the work of memory, otherness, transmission) in order to get them to ring out together. The two texts used are Pessoa’s Book of Disquiet and Toledo’s Oublier, trahir et puis disparaître.